TAMO’s founder and executive director, Meghan Kavanah, is a lifelong horse enthusiast, with extensive experience in the horse industry. Although riding since childhood, it wasn’t until after college that Meghan decided to pursue equestrianism professionally. 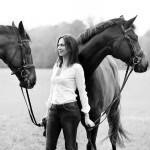 At that time Meghan spent 10 years apprenticing with top dressage trainers in the country, learning both the riding skills and management skills necessary to run a successful training business. Currently, Meghan oversees the training operation at Somerset Farm in Middleburg, VA while, at the same time, competing in the performance horse industry as a USDF bronze and silver medalist. A wild mustang owner herself, Meghan is passionate about the need to protect America’s wild horses, and thus was inspired to create TAMO.